Message: Hi. I’d say pardon me, but.. I find myself now looking at a situation in which I might want to use some dye, and your site among hundreds of search results seems to be the only source of information, for me, anyways. Do you know what Velukid suede is? I’m having trouble finding out exactly what that is. And I’m the owner of a pair of shoes with a velukid suede segment that I’m considering dyeing. It’s safe to assume I can really only go darker, right? If I have a medium red, say: how would I determine what to use in terms of color to achieve a darker purple, say. And then what are my choices of dye? Interesting question. Velukid seems to be a brand name: is it a type of real suede, or is it a synthetic suede? I think it might be a type of suede made from sheep leather, but I am not at all certain. Dye is transparent, so it allows you to go darker only, never lighter. If you apply a cyan-colored dye to a magenta background, you can get a true purple. If you apply blue to a true red, you will get a dark, dull purple. This might work for you. 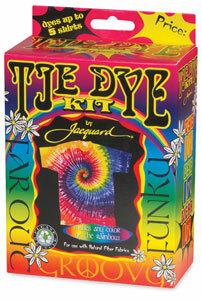 However, you must match the type of dye to the chemical composition of the material you’re dyeing. A natural suede is chemically very different from a synthetic polyester suede, so they cannot be dyed with the same type of dye. Even a natural suede could be very challenging to dye, because the metal salts often used in tanning can affect the color of any dye you use, sometimes surprisingly. It is always important to test your dye or paint, using an inconspicuous part of a garment (such as the inside of a hem), but there’s often no inconspicuous part to a shoe, so testing may be impossible. You can test your color by applying it to a scrap of material from the fabric store that is similar in color to your shoes, but this won’t give you any information on how well the dye will work on your material, since we do not know exactly what it is. All in all, I advise against dyeing these shoes. Painting, however, just might work.Transparent paints tend to give a nicer feel than opaque paints, but opaque paints give you more options for color changing, since they more-or-less cover up the color beneath. If you use a thick paint to color a suede-texture material, the paint will cover the nap, leaving a smoother, harder surface. If you use a very thin paint, it will have less effect on the texture of the suede, but it will still have some effect on the way it feels. Do not expect the suede to be as soft and brushed-feeling afterwards. 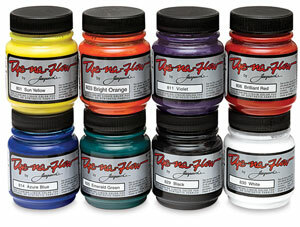 For a very thin paint, I would suggest you might try Dye-Na-Flow, which is a very liquidy fabric paint made to imitate dye. You can dilute it with up to 25% water to increase its thinness. For a thicker, more opaque paint, I think that maybe a leather paint would be best, such as Angelus Leather Paint. Both of these types of textile paints can be ordered in various colors from Dharma Trading Company. If the shoes have been treated with a silicone water repellent finish, which would be good for protecting them against being quickly ruined by street dirt, even paint will not stick to the surface. There is a product, Angelus Leather Preparer and Deglazer, which is said to be able to remove such finishes. Unfortunately, I do not know whether the results are good for painting. This entry was posted in dyeing leather on December 30, 2014 by pburch. Can urea solution be stored? Hey Paula and dye friends, I have a question: can urea solution be stored? I’m going to be doing some fiber reactive periodically over the next month, and it would be nice not to have to mix it every day I need it. Thanks! Urea can go bad. When it does, it smells like ammonia. Store urea solution in the refrigerator, and always give it a sniff before using. If it smells like ammonia, do not use it, because it can mess up the pH of your dyeing reactions and have unpredictable effects. In contrast, you can store soda ash solution forever; it never goes bad. This entry was posted in dye auxiliaries, urea on December 29, 2014 by pburch.